Tonight was the SF Pride board's first meeting after the very successful parade and celebration, and members of the community were allowed into the Pride office and had to wait 15 minutes before the meeting room was opened to all. Davace Chin, left, admirably facilitated most of the meeting, and fellow board member Javarre Cordero Wilson, who sported an "I Heart Being Black" button, assisted him at times. During the three hours I was present, an estimated 75 people packed into the meeting. Some stayed for all of the meeting, and two handfuls of queers left early or came only for a short period. I noticed about four thirty-somethings and no one under 25. Fellow attendees, did you count any twenty-somethings? Not that there's anything wrong with us LGBT seniors and middle-agers, but where were the younger guys and gals? The former lawyer for SF Pride, Brooke Oliver, who sure likes to hear the sound of her own voice, made four rather complex motions regarding members having access to emails of other general members and deadlines for statements of new or current board members. She monopolized more of the meeting than anyone else and should have come prepared with her detailed motions on paper, instead of reading from hand-written notes and from the web on her mobile. Her motions passed. This is Joe, who handles event management for Pride weekend and he received hearty applause for his efforts. Longtime community documentarian and Bay Area Reporter photographer, and voting member of Pride, Rick Gerharter, was there snapping away. He definitely needs to set up a profile on SilverDaddies.com. The board president Lisa Williams, left, listened to a comment being made about my two my two motions as board secretary Lou Fischer took notes. My two motions were simple, requesting SF Pride post the past twelve-months of monthly board meeting minutes on their site and do so from now on, and to post the written procedure for how the parade contingent line-up is determined along with the 2013 line-up. My motions passed. The bear on the left, whose name I don't know, made several cogent remarks and my friend Patrick Connors tweeted and shared pix during the meeting. His Twitter feed is here. Your humble blogger in a photo tweeted by Patrick Connors. 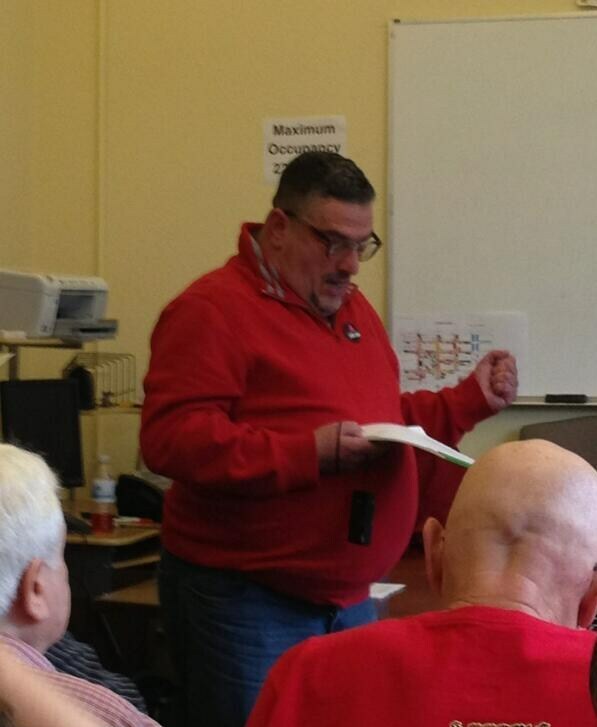 Former board president Joey Cain gave wonderful clarifications about SF Pride rules and by-laws, and general history of voting procedures for board membership. He also kept track of various motions on the floor and reminded us of them, which was very needed at key points. A grand marshal a few years ago, Gary Virginia, weighed in with good comments about SF Pride's recent changes in the membership process.Because of a screw up, his membership renewal wasn't handled properly and he couldn't vote on the motions. Only valid current members were allowed to vote and provided with red paper squares to do so. It was a long meeting, very productive, quite pleased I went (and raised my voice only once), believe a healthy shaking up of lots to do with SF Pride continues and hope that the group's CEO Earl Plante is well. He was absent and I was out of the room when his colleagues explained why he wasn't present. See you in August at the next members' meeting!